In today’s health care market, there’s a growing disconnect between EHRs and HIPAA compliance. The misconceptions surrounding requirements for EHRs and HIPAA compliance under the law have lead many health care professionals into hot water with HIPAA breaches and violation fines. Both are essential parts of running a successful business in health care. EHR platforms give your practice a secure, care-focused means of maintaining protected health information (PHI), such as patient records. HIPAA regulation mandates that health care providers comply with national privacy and security standards to safeguard PHI. PHI is any demographic information that can be used to identify a patient. Examples include: names, dates of birth, Social Security numbers, insurance information, phone numbers, full facial photos, and health care records, to name a few examples. Under HIPAA regulation, EHR data is necessarily considered PHI because of the amount of sensitive demographic information collected and stored in EHR platforms. EHR providers, therefore, must be HIPAA compliant in order to protect clients’ health care data from security incidents and government fines. Many misconceptions surround the relationship between HIPAA and EHRs, though. Even though an EHR vendor may be HIPAA compliant, that doesn’t mean that the organization using the EHR platform is compliant as well. End-users of EHR platforms must have their own unique HIPAA compliance programs in place in their organization in order to satisfy the law and keep patients’ data safe. 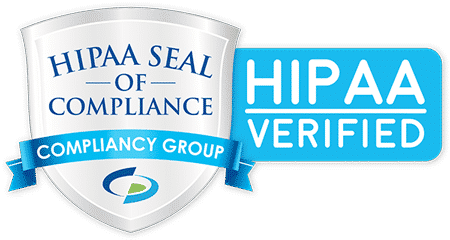 Adopting both a HIPAA compliance solution and an EHR platform for you business is the best way to demonstrate your commitment to the safety and integrity of patients’ sensitive health care data. A good patient engagement strategy is at the heart of attracting and retaining your clients. When you adopt both an EHR platform and a HIPAA compliance solution, you do the double work of protecting your practice and ensuring that your patients’ data is kept safe. Initiating conversations with patients about the work you do to address HIPAA can go a long way to building lasting trust in this changing climate of digital and electronic health care.